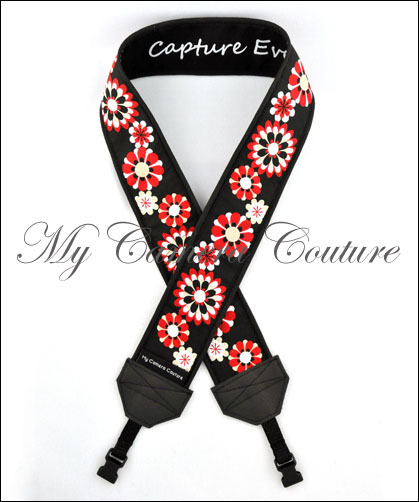 This strap has red, white, and tan flowers on a black background. 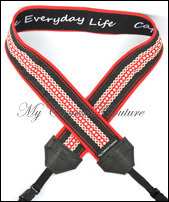 It is available with either a black or red lining (cs_108). Choose either our quick release hardware (letting you switch straps or swap them between cameras easily) or our standard (not quick-release) attachment straps. Either way, the total length (with attachment hardware) is approximately 44". 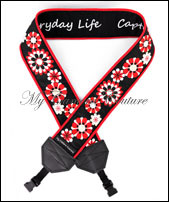 This strap would look spectacular with red attachment hardware. Interested? Look for the option at the bottom of the page. 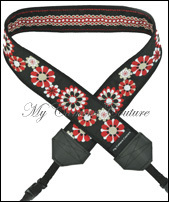 Note that straps with coloured attachment hardware are made to order and may take an extra few days to ship.